Fuchu Home Forest and Museum (府中郷土の森) is a public park with flower gardens, a planetarium, a museum and traditional houses. 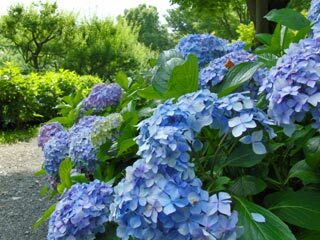 It is popular Hanami Spots for Ume, Japanese plum and Ajisai, Hydrangea. There is water play ground and open field for family activities. Also, they offer you the experiencing craft works. Admission: 200 yen for adult, 100 yen for kids. In Fuchu Home Forest and Museum, there are several traditional houses replaced from the Fuchu area. ... is the house of the merchant which also contains the store. The house was also used for the hotel of Emperor Meiji. ... was built in 1886. It remains the look of the shops of Edo period. ... was built in 1871 as the post office. Yajima Kyubei offered his house as the post office. ... are the farmers house built in late Edo period.